Wash the chicken pieces and with the help of a fork pierce the chicken on all sides so that the marination can seep in. Marinate these chicken pieces with chilli powder, garam masala, turmeric, salt, chopped coriander leaves and lime juice, make sure the chicken pieces are very well coated, keep the marinated chicken pieces aside for at least 20-30 minutes (it would be best to refrigerate it). Whisk the egg in a bowl. Dip the marinated chicken pieces individually in the egg and then in the breadcrumbs. The chicken pieces should be coated well with the breadcrumbs. 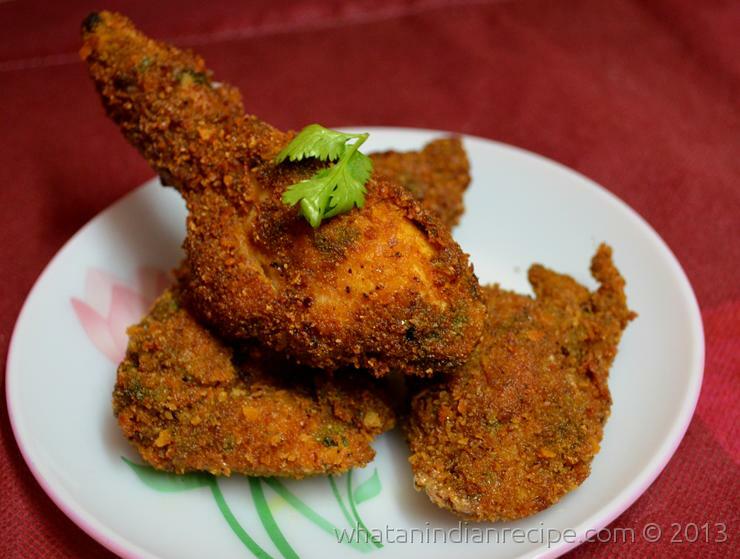 Heat the oil in a pan/kadhai and deep fry the chicken pieces till it turns golden brown on all sides, drain the excess oil onto a tissue paper. Serve hot with dhaniya chutney, curd mayonnaise dip or simply with tomato ketchup.